Grace isn’t always obvious. When I was four or five years old, my Grandma Meta gave me a tea set. 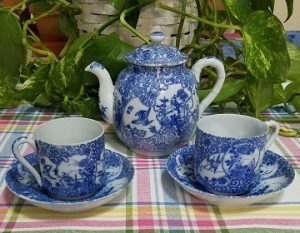 Made of porcelain, (they didn’t do plastic in those days), it had no maker’s mark, and the blue and white design of birds wasn’t hand painted. It was a child’s set from her own childhood, ca. 1900. To me, it is as precious as Royal Blue Delft, or a Ming Dynasty vase. You see, growing up, I was “accident prone.” It seems I was always running into things, knocking stuff over, spilling my drink at the table. My mom said my mind outran my body. Part of the problem was I tried to keep up with my sisters, five and six years older than me. But when they thought I couldn’t hear, my family often just referred to me as clumsy. I had been to the doctor three times for stitches in my head before I turned four. It wasn’t abuse, just me. Before I walked, I climbed, and once I walked, I ran. Everywhere. Heedless of tripping hazards and other obstacles. I was the third – and wildest – of three tomboys. But Grandma Meta saw something else. In that wisdom that seems peculiar to grandparents, my grandmother gave me the tea set. Not my older sisters, but me. First, I learned to make tea. (Hard to miss with tea bags, so long as I had help heating water.) An acquired taste, the tea was better with milk and sugar. Good thing my new set had a creamer and sugar bowl. It also had small plates just the size for cookies. Soon I learned to heat my own water in the kettle. Before long, I was having tea parties with my friends, after admonishing them to be careful! I even grew to appreciate the taste of tea by itself, although I did miss watching the beautiful clouds billow up in the cup. Then I learned to bake my own cookies. I still prefer baking to cooking. Throughout my childhood, my tea set remained intact. In fact, it survived several moves, crossed several state lines, and didn’t sustain any damage until our storage locker was broken into six years ago, after the last move. Unlike most of my keepsakes, the plastic bin my tea set was in wasn’t taken, but it was handled roughly. One saucer was broken in two. It can be glued, but I haven’t done so. I guess because it reminds me that we can’t control everything. I didn’t break it, but it is broken, nonetheless. And I still wonder, why? Why did she give me the set? I love beautiful things, and I’m very tactile. Is that why? “Don’t touch!” was a constant refrain growing up. I rarely managed not to touch, but I never broke anything of value. In fact, my Grandma Ada had me dust her keepsakes in her living room, including the gold finished glass bud vases from my great-grandparents 50th wedding anniversary. Did Grandma Meta give me the set because she knew I would appreciate it, or because she wanted me to discover that I could? Was it to learn the joys of friendship over a shared drink? Did she worry that I might be careless and destroy it, or did she hope – or know — that it would be cherished? Even as a child, I understood that things people valued had to be handled carefully. But it took a long time to understand that people need to be treated carefully, and even longer to understand that I, myself, am precious and worth taking care of. My grandma has been gone for 35 years now, but her gift remains. More than the fragile porcelain that has survived beyond expectation, she gave me her trust. She gave me, a child, respect and dignity as a person. She gave me a cup of grace. I hope to remember the mental note to offer this kindness to my own grandchildren someday. Your Grandma Meta was very wise!